It’s not very often you can get a group of strangers from across the country to pull together for a hog hunt, and even more rare when all of the hunters are women. What started out as a thread on Bowsite.com’s bulletin boards turned out to be one of the most thrilling hunts I’ve ever had. You see, I had posted an inquiry last summer, looking for other women who’d be interested in a ladies-only hog hunt at our Oklahoma operation Shiloh Ranch Hunting Camps. The roster filled quickly. When the weekend finally arrived we were blessed with good weather as each of the guests drove into camp. After the gear was unpacked and bunks had been claimed we began studying maps -indicating stand locations. The wind direction was favorable for many of the stands and everybody had quickly decided on which location they would like to hunt. Within minutes, everyone was camouflaged and scent-free. Being the outfitter and guides for this hunt, my husband Matt and I stayed in camp as each of the hunters walked down the trail toward their stands. We had five women join us on this hunt, Claudia from Arkansas, Barb from Kentucky, Donna from Missouri and Deb and Linda from Minnesota. We had seen over a dozen deer from the road into camp so this was a good indication that the animals would be moving that evening. With wild hogs, you just never know what to expect. An area can be crawling with them one day, then void the next. As the hunters headed down the trail, I learned later that they had encountered a passel of hogs running through the brush ahead of them. They had considered stalking the animals, but made the decision to get to their respective stands instead. From all accounts that night, the hogs were really on the move. Everyone had seen at least a half dozen or more hogs of varying sizes before dusk. As daylight began to disappear, one by one the hunters returned back at camp. I knew that if anyone was returning before dark, it had to be for good reason, and was thrilled to hear that Claudia had made a good shot on a hog down at the creek stand. Before I could get my boots laced I could see Donna walking up the trail. She too had hit one, and from her description it sounded like a well placed arrow. As Claudia and I headed to the creek to track her hog, I heard the radio crackle as Linda and Deb both reported hitting hogs. Four of the five hunters not only saw animals, but made good hits on them that night. One by one, we began the arduous task of tracking and hauling the hogs back to camp. As Claudia and I walked into the woods near Claudia’s stand she related her hunt to me. She hadn’t been in her stand long before animals started moving through the area. There was still plenty of daylight when a group of hogs followed the creek past her stand. 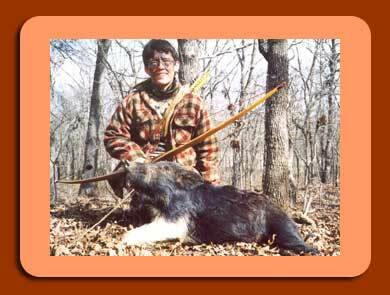 Claudia drew her recurve, released the arrow, and then watched as the hit hog ran back down toward the creek bank. She was confident the hit was good, and heard the thrashing of brush behind her as the hog made it’s last run. It’s not uncommon for hogs to leave a scant bloodtrail, and this was the case with Claudia’s. As she climbed from her stand, no blood could be found, but she knew exactly what trail the hog ran down. Being confident in her shot, she returned to camp for help. Within minutes, we were following the bloodtrail which led right to the spot where her hog had expired - 40 yards behind the tree Claudia was perched in. This being Claudia’s first traditional bow-killed animal made it even more special for both of us. Next on the agenda was Donna’s hog. She too had been hunting from a ladder stand and watched as her hog ran into the thick brush that engulfs the small opening she was hunting. With hogs milling around beneath her all evening, she wasn’t even able to leave her stand until after dark. By the time I had arrived she had marked the bloodtrail and had followed it into the thick brush. Despite a perfect hit on this hog, it left very little for us to track. We picked up pinhead-sized droplets, following the trail into thicker and thicker cover. One of us would mark the last blood as the next struck out ahead searching for the next drop. Suddenly, Donna yelled “There’s my hog!”. As we approached it, I could better see why the hog left so little blood. With a perfect double lung hit, this hog died on the run sprawled out in the greenbriers that filled the forest floor. Her hog was a mature boar weighing just under 200 pounds, and with a thick shield covering it’s vitals. That shield, along with a boar’s thick hide effectively sealed the “leak” in his thorax. While skinning and quartering Donna’s hog, we found something interesting- a three-blade broadhead embedded firmly in the hog’s spine. The broadhead penetrated the vertebrate and was sticking out the other side. I don’t know how this animal survived without being paralyzed. It appeared as though the blade should have severed the spinal cord. Donna refers to that piece of spine as her “third trophy” and is a good testimony to how hardy wild hogs can be. While Donna and I struggled to drag her big hog through greenbriers, Deb and Linda were on their own search. 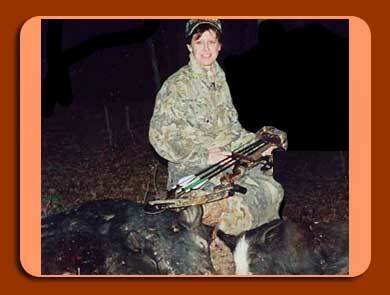 Linda had made a good hit and had the good fortune of seeing her hog drop within sight of her stand. By the time Matt got around to picking her up, she already had it dragged to the road. They then moved on to Deb’s stand. Deb was sitting in a stand located near some of the densest thickets on the property. Despite making a good shot, her hog ran directly into these thickets. From the second it was hit, her hog had left a generous bloodtrail, something you learn to appreciate when hunting hogs. They thought they had an easy tracking job in front of them when seeing how much blood this animal was losing but after tracking the hog over 200 yards, they finally reached the end of it’s trail. This hog had run right in the midst of an area that was hard hit by last year’s ice storm. Being surrounded by deadfalls and fallen greenbrier vines, they soon learned that shooting and tracking the hog was the easy part compared to fighting your way through briars while wearing a 3-D Scent-Loc suit! Barb was determined not to leave without filling her tag. She continued hunting hard while the rest of us packaged meat and capes for the freezer. After working hard all day to package the meat from four hogs, I settled in front of the campfire for a relaxing evening, never suspecting that we’d have a repeat of the previous night’s success. 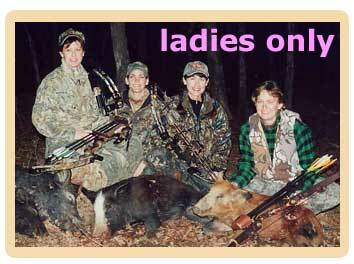 With three more hogs being taken Saturday night, these ladies proved to be out for more than just a walk in the woods! Sunday morning however, turned out to be the crown jewel of the weekend. Shortly after daybreak Barb returned to camp. For the first time since we started guiding on this piece of property, we had a hunt with 100% success. 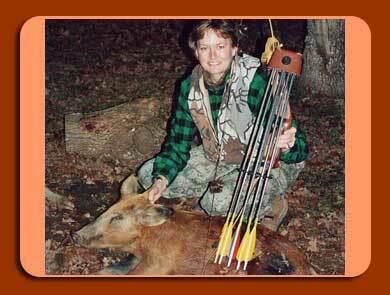 Barb was hunting with a longbow and thought she had hit her hog just a little bit high as she could see her fletching as the hog ran off into the brush. She was sure she heard the hog moan and then rustling in the brush just a short distance away, but thought it best to wait a few hours before tracking it. Once she got out on the trail though, she found that her hog had in fact expired within seconds. 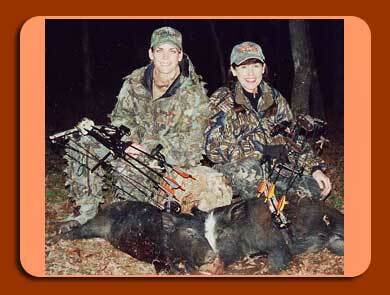 Her broadhead had severed the hog’s aorta, leaving no question as to how quickly it died! This hunt turned out to be one of the most exciting hog hunts we’ve hosted. Not only were these ladies some of the most devoted hunters we’ve been around, but they all pitched in to help each other. If anyone needed help with field dressing, there was always plenty of assistance. Everybody pitched in to help everyone else with every aspect of the hunt, and we all shared each other’s excitement every time an animal was brought into camp. Even though we were all strangers to each other Friday morning, by Sunday afternoon I felt as though we had known each other all our lives. The camaraderie and stories that were shared around that campfire won’t soon be forgotten, and I think I can speak for everybody when I say that.